We have recently experienced an increase in illegal parking within our neighborhood. The most common infraction is illegally blocking the sidewalk. (City of Houston, APK-13 Blocking or parking on sidewalk- $40) And, many cars are parking in City of Houston “no parking” zones, out of the street, but still in the public right-of-way. There have been increased patrols by Parking Management. If you have been parking illegally, now would be a good time to find a legal place to park in your driveway or on the public street. Remember, don’t block the sidewalk. If your neighbor parks illegally, send them to this post as a gentle reminder. The reminder here will be better than any citation. Hopefully they will thank you for it! The Houston Planning Commission is examining off-street parking issues and whether changes to Chapter 26 of the Code of Ordinances are needed. Some of the topics that will be discussed include, but are not limited to shared parking, parking management areas, types of occupancy and intensity of use (i.e. bars, types of restaurants, etc. ), parking incentives for development along transit corridors or for restoration of historic buildings, lifts and valet parking, just to name a few. Wednesday, April 7 from 4:00 – 6:00 p.m.
Wednesday, April 14 from 4:30 – 6:30 p.m.
Wednesday, April 21 from 5:30 – 7:30 p.m.
http://library.municode.com/index.aspx?clientId=10123&stateId=43&stateName=Texas; choose Chapter 26 in the left window. If unable to attend one of the meetings, comments and ideas may be submitted by email to parkingcomments@cityofhouston.net or by mail to Dipti Mathur, City of Houston Planning Department, P.O. Box 1562, Houston, TX 77251. The process may be followed on the Planning and Development Department’s website at www.houstonplanning.com. I attended the March 2010 Neartown meeting this evening, hosted by David Robinson, the Neartown president, at the Cherryhurst Park Community Center. 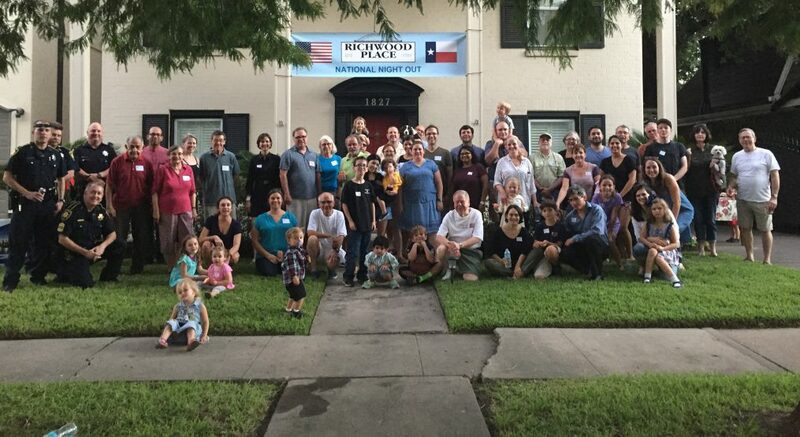 Richwood Place is now a member in good standing of the Neartown association. The meeting was attended by members and officers of Neartown Civic Associations as well as representatives from the offices of Council Member Wanda Adams, Council Member Stephen Costello, and Senator Rodney Ellis. The Neartown Association is working on a number of CIP requests on behalf of the superneighborhood and the 21 civic associations that Neartown represents. David Robinson, Neartown President, has complained to the city and our council members about the lack of transparency in this process and the difficulty of the request process.Richwood Place has submitted a request to Council Member Adams and I will forward that request to Neartown’s leadership. There are many other neighborhoods in our superneighborhood that are having severe sewage problems and other matters that need to be addressed by CIP as soon as possible. Carnegie Vanguard High School (web site) is a HISD magnet school for gifted and talented students. It is currently located in South Houston and will be relocating to Taft and West Gray in 2012. They will have 600 students in 2012. They are currently seeking a parking variance to prevent having to create an excess number of parking spots on a green lot. The city requires they have in excess of 300 parking spots, but they only have 104 in their current location and are requesting a variance to allow 225 parking spots. There has been a lot of talk in the neighborhood, in the news, and on this web site about a proposed HEB on the corner of Dunlavy and West Alabama, which by some is considered the most valuable piece of open property in the city. HEB has purchased the property. They have applied for a re-plat without variances. This does not require a vote before the planning commission. The City has encouraged HEB to work with Neartown and the association President has met with HEB’s Director of Real Estate at HEB’s corporate headquarters. He reports that HEB has hired an arborist to assist with the tree-filled property and that HEB is pointing out that a supermarket would create new jobs, be an increase in the tax base, and that they could offer a green plan that is conservation oriented. Representatives at the meeting discussed a number of potential layouts, traffic issues, and land use concerns. The property is on the agenda for the City of Houston Planning Committee on April 1st. There will be a Neartown Development Forum at the end of May for residents to work together and with the city to discuss the development and planning of the Montrose area. I will post an update when there are more concrete details.